↑ कुमार, राकेश; सिंह, आर. डी. ; शर्मा, के. डी. (10 सितंबर 2005). "Water Resources of India" [भारत के जल संसाधन] (PDF). करेंट साइंस. बंगलौर: Current Science Association. 89 (5): 794–811. पहुँचतिथी 13 अक्टूबर 2013. ↑ "Sage River Database". ओरिजनल से 21 जून 2010 के पुरालेखित. पहुँचतिथी 16 जून 2011. ↑ "Integrated Hydrological DataBook (Non-Classified River Basins)" (PDF). Central Water Commission. प. 9. पहुँचतिथी 2015-10-13. 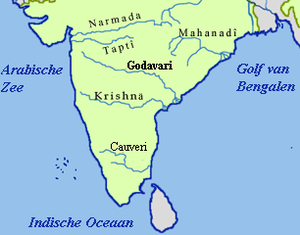 ↑ "Dakshina Ganga (Ganga of South India) – River Godavari". Important India. पहुँचतिथी 2015-10-21. 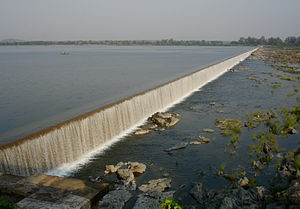 ↑ South Asia Network on Dams Rivers and People (2014). "Shrinking and Sinking Deltas: Major role of Dams in delta subsidence and effective sea level rise" (PDF). पहुँचतिथी 15 January 2016.